. . . and thank you for visiting our web site. For over thirty years, Glenwood Private School has been offering the parents of Montgomery County, Texas a unique opportunity for their children. 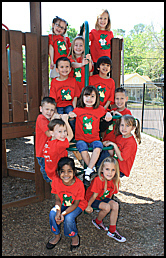 By combining excellence in education with a healthy, wholesome environment, Glenwood has built a solid reputation as the area leader in early childhood development and instruction. If you're interested in providing the best care for your children, you've come to the right place. We hope you'll take a few minutes to browse the rest of our site, where you can learn more about the history of Glenwood Private School, review information about the various classes we offer, and check out our very competitive rates. While you're at it, you may want to download and read our latest newsletter. In the end, we hope you'll give us a call, or contact us by email. We look forward to meeting you and adding your family to the Glenwood family of satisfied parents and children.